In today’s world, we see biases everywhere whether it is gender bias or bias of any other type. The unfortunate part is that many people do not even notice it. The main reason of this is that they are not affected by it. If someone targets them for the same things, they would notice it. You might have read it and heard it many times that most writers use mankind to refer to entire humanity, which is also a type of gender bias. They should have used humankind to refer to all of us collectively. Instead of accepting their mistake and pledge to not repeat it later, they ask you to “Move on and get over it” which is not the right way to go about it. It is the duty of writers and speakers to keep their writing and sayings free from bias in order to make this world a better place. Instead, they give justification that there is no need to replace “he” or “she” or his or her because there is no pronoun in the English language to replace these words. Even if this justification is true, writers should always try to mix it up rather than repeatedly using him or her throughout their writings. This makes their writing gender bias. This is only one type of bias, there are many more that includes race, religion, culture etc. As a result, their writings spread hatred among the society instead of spreading the love. This is one of the biggest disadvantages of writing bias. Writers can use words such as “They” instead of referring to a girl as “she” or a boy as “he”. They can also refer a person by their name. They can omit the pronoun and use different pronouns. There are many ways to avoid gender and other type of biases in your writings. 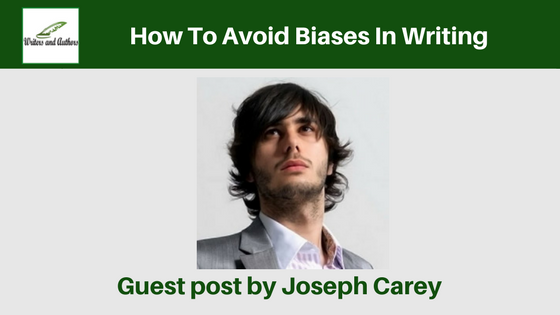 Writers should focus on finding ways to avoid biases in their writings. References to physically-disabled people are another common form bias in the writing. It is better to use less harsh words and sentences such as “uses a wheelchair” rather than highlighting the disability. These are only a few examples and there could be countless others. All these direct references violate the people first philosophy, which says that when you are referring to a person in your writing, you should focus on the person, not the weakness or disability. You might have gone through many books where you will find the writer only pinpointing the disability of a person multiple times without focusing on the other aspects of personality. There are many other ways to avoid other types of biases such as race and religion. You can collectively call them as humans instead of referring to them as white or blacks, Christians or Jews. A writer should do as best as they can to avoid any kind of gender bias. Writers must review and revise their writings and make necessary adjustments to it before sending it for publication. With minor adjustments, writers can easily overcome all types of biases and make their writings more effective and refined. A piece of writing free from any type of bias has a much higher impact on readers as compared to writings laced with biases. We need to think along these lines and take concrete steps in order to spread love in the world through our writings. If that does not happen, it will continue to sow the seeds of hatred and our world will never be a better place. Biased writings only create grudges against fellow humans and we should stop it now. Joseph Carey is a Pro Writer and Blogger. He is passionate about writing fiction stories. In addition, he also works as an expert essay writer. He is a car freak and enjoys driving in the outback. You can join him on G+.